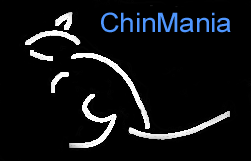 ChinMania - Chin Colour Genetics: Is Standard Grey a Colour? Is Standard Grey a separate colour? Standard Grey is NOT really a separate colour. Rather, it is a combination of a number of colour factors that just happen to blend in natural populations to produce grey. This is normally called the "agouti" pattern. In other animals, the agouti pattern is quite often some shade of brown, such as in Wallabies, Mountain Viscachas, Degus, Gerbils, DeerMice, Rabbits, Hares, Deer, Moose, Bison, Beavers, etc. The Standard Grey is neither dominant nor recessive but midway in between: It is best characterized as "neutral"
A particular colour arises in a Chin when a specific set of alleles arise via mutation and "over-power" the rest of the colour alleles. [It appears that, in Chins, each colour trait involves a separate set of alleles, although there may be some overlap.] In some cases, possession of a set of a colour alleles for a particular colour on only one half of a chromosome is sufficient to override the Standard Grey ["agouti"] colour: these are the dominant colour traits. In other cases, the alleles for a particular colour trait must be present on both halves of a chromosome to override the Standard Grey: these are the recessive traits. The symbol g can be used to represent Standard Grey. [Often in textbooks, the symbol a is used instead to represent " agouti".] Thus, a Standard Grey Chin would be represented by g-g However, it should more properly be expressed as the combination of all the possible colour traits in their non-expressed condition. More on this later [3 paragraphs below]. Dominant traits are represented by capital letters with their non-expressed [or neutral] state being represented by lowercase letters. Thus, instead of using W-g Wilson Whites [as well as White Mosaics and Silvers] are more properly expressed as W-w Note that we can't use W-W because the Wilson White trait cannot exist in the homozygous state due to the Lethal Factor. [For your convenience, you can use WM-wm or W*-w* to represent White Mosaics and Silvers. Similarly, WM-WM cannot exist because of the Lethal Factor.] In a similar fashion, the Velvet Trait in Black Velvets would be best represented as BV-bv rather than BV-g Again, the BV-BV condition cannot exist because of another Lethal Factor. Finally, heterozygous Beige should be represented as B-b rather than B-g . B-B is already used for homozygous Beige. Recessive traits are represented by lowercase letters with the non-expressed state being represented by capital letters. This is the opposite pattern as for dominant traits [and is a source of much confusion]. Thus, heterozygous Violet [aka "Violet Carrier"] is more accurately expressed as v-V [remember, capital V is the non-expressed allele] rather than v-g Homozygous Violet is normally expressed as v-v Similarly, for heterozygous Sapphire [aka "Sapphire Carrier"], s-S is more accurate than s-g Again, s-s is already normally used for homozygous Sapphire. Although Ebony is variously regarded as "weakly dominant" or "cumulatively recessive", lowercase letters are used represent its expressed state. In the heterozygous state, it is more accurately represented as e-E rather than e-g.
Each Chin colour is composed of not only the aforementioned expressed alleles but also the non-expressed alleles for all of the other colours. Thus a pure Wilson White would be "expressed White" plus "non-expressed Velvet" , "non-expressed Beige" , "non-expressed Charcoal" , "non-expressed Ebony" , "non-expressed Sapphire" , and "non-expressed Violet"
Each of the 7 symbols [or colour traits] are passed along independently of each other to the sperm/ovum, and hence, to the offspring, If one were to compute all of the possible permutations of a Wilson White X heterozygous Violet mating, this would work out to 49 possible combinations. However, all but 3 will be the same and code for Standard Grey. The remaining three would code for Wilson White, Violet Carrier, and Wilson White Violet Carrier. Figuring this out via Punnett Squares using all of the colour symbols would be formidible. Furthermore, frequent usage of such long sequences of symbols is somewhat cumbersome. So, when W-g is used for a Wilson White, the " W could be shorthand for b + bv + W + C + E + S + V [with W being the only expressed alllele] , and g would then be shorthand for b + bv + w + C + E + S + V all of the non-expressed alleles. Confusing, eh? One would need to keep the aforementioned long symbol sequences handy in order to decode the short forms. Which is easier to understand and use? Well, the choice is yours!